As Mark touched on the existence of two Facebook-centric phones being introduced to the world at Mobile World Congress 2011 in Barcelona, Spain, we will look at them in greater detail today. Adopting a dance stance, we do wonder whether future iterations of such handsets will not be enhanced with a suffix, but rather, take on other names like the HTC Rock, HTC HipHop or even HTC Classical. I digress, let us see what these social networking phones are able to do. 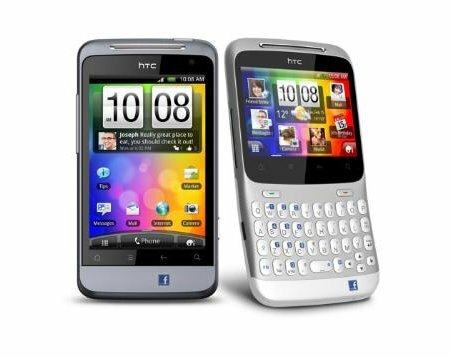 First off, the HTC ChaCha and HTC Salsa do stand out from the rest of the smartphones that are on the market simply by virtue of a dedicated Facebook button that delivers one-touch access to the key functions of the Facebook service. Of course, that doesn’t mean that the HTC Sense experience is diminished in any way – no sir, you will find yourself more entrenched in Facebook more than ever now. After all, with over 500 million active users worldwide, Facebook is a tour de force that will surely be a powerful brand name to be associated with, making sense for HTC to jump at the opportunity. The Facebook button on the HTC ChaCha and HTC Salsa are context-aware, where it will gently pulse with light whenever there is an opportunity to share content or updates through Facebook. This means pressing it just once will let you update your status, upload a photo, share a Website, and even post the song that you are currently grooving to. How about snapping a photo of friends on your phone and have it uploaded instantly to Facebook? The possibilities are more or less endless, and perhaps HTC does not want to put all their eggs in a single basket, hence the splitting up of the Facebook phone to theHTC ChaCha and HTC Salsa variants. The former will come in a unique tilt design which shapes the display and physical QWERTY keyboard, making it a snap to see everything that goes on as well as being easy on your fingers as you type. Features include a 5-megapixel color camera with auto focus and LED flash and a VGA front-facing camera, a 2.6-inch, 480 x 320 resolution landscape touch screen. As for the HTC Salsa that reminds us of the HTC Legend, it is more of what you’re used to if you aren’t a BlackBerry addict, sporting a generous 3.4-inch, 480 x 320 resolution touch display. Expect both handsets to hit Europe and Asian markets in Q2 this year, while they will arrive Stateside via AT&T in an exclusive agreement.